First and foremost, please read the trigger warnings. I will say some of the things are described in detail and will set you off if you get triggered by verbal, mental, physical abuse and domestic violence. I have to say that I don’t really get triggered by most things but in this book, while Adrien’s family was treating him so horribly, it reminded me of my family and then I just felt down in the dumps. People sometimes don’t realize how toxic things are in their own life until they hear about it in someone else’s life. Micah and Adrien have both had crappy lives and both have so much healing to do. I loved these two together at first, but then halfway through the book something happened, and it just didn’t have the same vibe anymore. The ending seemed rushed and not really a happily ever after but a happy for now, which didn’t help my feelings towards this book either. 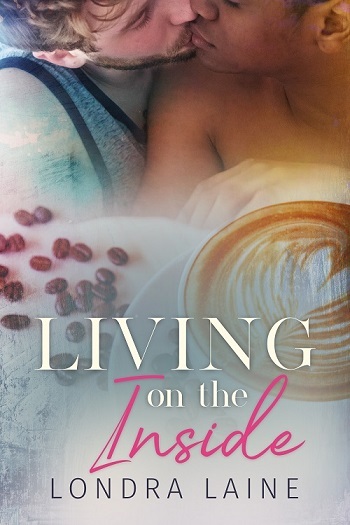 Having adored Londra Laine’s writing in Curl Around My Heart, I couldn’t wait to get my hands on Living on the Inside. For me, this was a much tougher read because of the subject matter. Between Adrien’s domestic abuse flashback scenes and the emotional penance Micah must pay (rightfully so) as he earns his way back into his son’s life, Laine ran me through the wringer. A word of warning, the domestic violence scenes are frighteningly realistic, causing me to cringe in sympathy and I’ve never been in an abusive relationship, so if you’re a domestic violence survivor, please read with caution. The aspect I loved most about the story is also the aspect that irritated me the most, depending upon the character(s) I was confronted with at the time. Adrien’s conscious decision to pay it forward and offer Micah a job because of his record – and because he seemed like a good bet as an employee – warmed my heart. When faced with an ex-con with extensive customer service skills, Adrien saw his chance to give another human being the same chance someone gave his father – a chance that had it not been given his father, Adrien probably would not have been in the position to help Micah out. Yet when his mother and siblings learn of his decision to hire an ex-con, they are less than receptive to Adrien’s decision and his brother’s outburst actually had me cringing on their father’s behalf. In their fumbled attempts to be protective of Adrien, they come off as insulting of their husband and father’s past, at least to me they did. I was surprised that Adrien actually called them out on their hypocrisy, but I was glad to see him stand up for himself. As for the actual romance between Adrien and Micah, it plays out quite awkwardly. For me, this wasn’t really surprising. As the business owner, Adrien has to temper his attraction to Micah, especially considering his past bad judgments (his characterization) when it comes to picking potential partners. Micah’s position is just as precarious because as much as he is attracted to Adrien, the thought that he could lose his job if things didn’t work out between them makes him wary, especially considering how hard it was to find a job and how much he enjoys working at Adrien’s coffee shop. This makes for two guys who are rather standoffish with one another as they actively fight their attraction. So during their first few attempts to be more than employer-employee, they kind of flail a bit as they try to find their way. As much as I enjoy watching two slightly dented people who complement one another fall in love, it’s even better when there’s an added level of realistic awkwardness like Adrien and Micah’s, making their journey more believable. Obviously, my heart broke when things come to a head in the story, but I was glad that they were able to find their way back to one another, even if their reconciliation seemed to come about faster than I would have expected considering their pasts. Regardless, I enjoyed Living on the Inside and am already looking forward to Laine’s next release. A forever-man for every man. 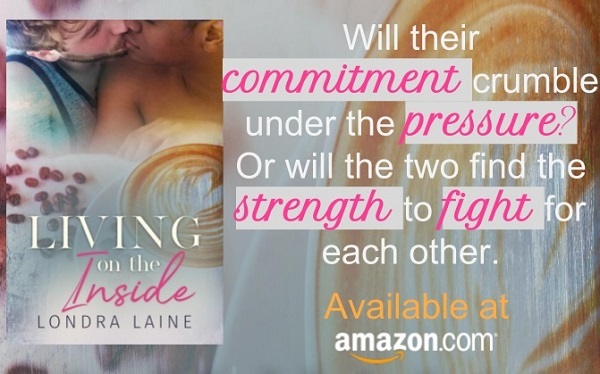 Reviewers on the Wicked Reads Review Team were provided a free copy of Living on the Inside by Londra Laine to read and review for this tour.